"We didn't set out to reinvent the Goldfish SHMUP genre"
In our April interview with Choice Provisions we spoke briefly about Shutshimi, a unique 2D shooter being published by the firm. The game is launching on North American PS4 and Vita consoles today, and creator Neon Deity Games has been speaking about the title's WarioWare-style gameplay. Levels last around 10 seconds, and any power-ups gained are quickly lost as you start the next stage - because your main character is a goldfish, you see? We didn't set out to reinvent the Goldfish SHMUP genre, but sometimes you go where the current takes you. 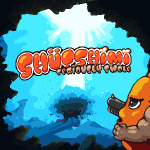 Shutshimi began as a game jam project made in under 24 hours, but we fell so deeply in love with the concept that we decided to go forth and flesh it out into a full game. Several months later we "finished" and released it into the deep blue sea, but we were still filled with a ton of great ideas, so we got to work on an update. That update spiralled out of control and became a vastly expanded version of the original game, adding 2-4 player local co-op, loads of wacky new power-ups, new and updated sprites and backgrounds, a ton of additional songs, brand new enemies and bosses, lots of extra hats, cross save and Trophy support, and even online leaderboards. You can watch the full trailer below - the Wii U version is coming later on, apparently. Welp, I'm not sure what I expected, but... it wasn't that. I'm quite intrigued now, I'll probably pick this one up. I can see the Grumps enjoying this. Not sure what to think there. If the price is right but tbh it looks like a 5$ game or less. 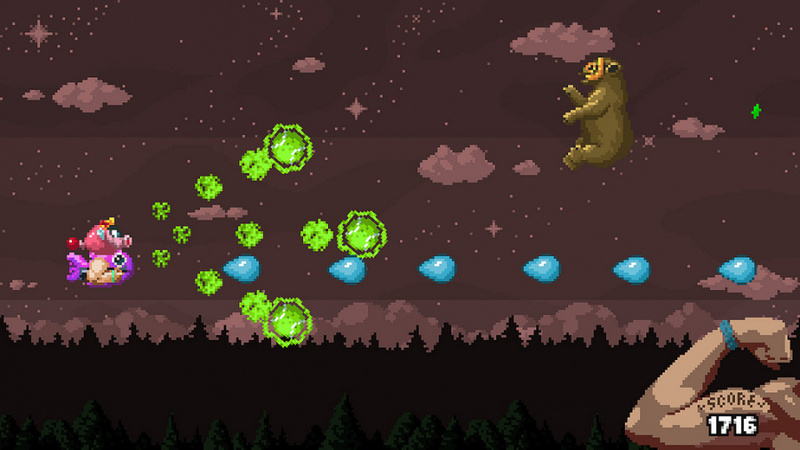 Looks rather cool, and makes me think of an even stranger and sillier Parodius. Well, I'm certainly intrigued. I'll get it for PS assuming the price is right, then if I like it well enough, I'll double-dip on the WiiU for dev support. I don't we'll be seeing to many more SHMUPS from the "major" companies. Still, why no mobile shmups coming till the Wii U gamepad. @TomKnows FullBlast is just one mobile game that comes to mind. Don't believe it's out yet for WiiU, though. A bit like Warioware? Could be fun.